Our next kitchen design course will take place in Dublin on March 17, 2017. Venue details to follow. If you are interested in attending please email info@ikba.ie to register. The course is suitable for homeowners planning a new kitchen. 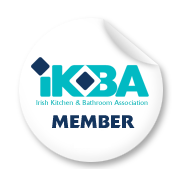 The Irish Kitchen and Bathroom Association is an organisation dedicated to promoting excellence in design, workmanship and customer service in the Irish Kitchen, Bathroom and Fitted Furniture Industry. Our members are independent kitchen, Bedroom and fitted furniture specialists who share our commitment to excellence and who meet the associations stringent criteria for membership. At the IKBA we value teamwork and recognise that good communication between our members and other professionals is critical to the success of many projects. Therefore we�ve invited the very best architects, designers, builders, crafts and trades people to join the IKBA as associate members. If you are renovating your kitchen, Bathroom, home office or bedroom or indeed building a new home the IKBA can help you to make informed choices. Register your contact details online with us today to receive our free ezine and to qualify for substantial discounts from many of our members and associates.